Donald Trump, the current Republican presidential frontrunner, speaks to a crowd of over 2,000 on Oct. 21 in Burlington, Iowa for a campaign rally. Trump's speech criticizes President Barack Obama and past Republican candidates John McCain and Mitt Romney. 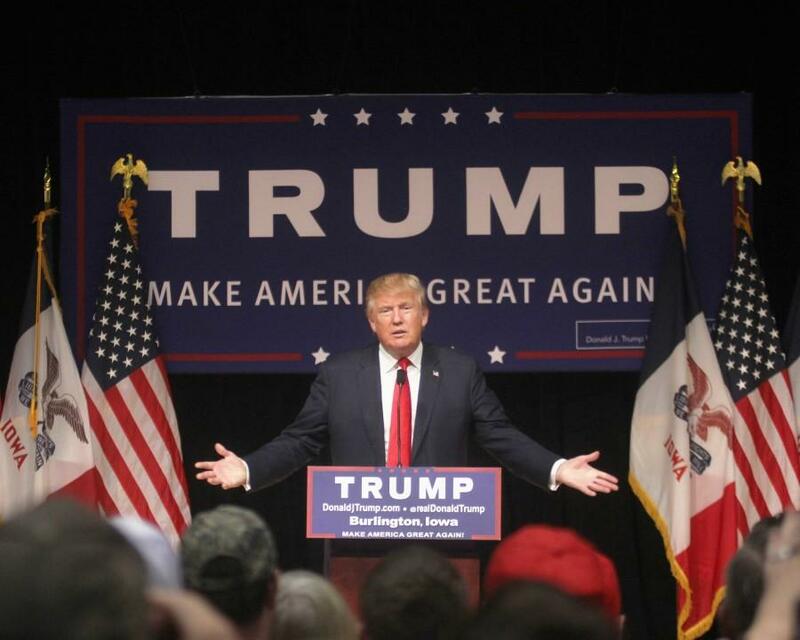 Property mogul-turned-politician and Republican presidential candidate frontrunner Donald Trump stopped at Burlington Memorial Auditorium in Burlington, Iowa on Wednesday, Oct. 21 for an event rallying over 2,000 people. Trump, known for his work on TV shows such as “The Apprentice” and being a frequent executive producer for the Miss Universe and Miss USA pageants, started off his speech with a jab at Vice President, Joe Biden. Running with the campaign slogan, “Make America Great Again,” Trump was not modest about his place in the polls as he went through each caucus state and proudly compared his percentages to other Republican candidates. Trump is unhappy with the current government and past Republican candidates, which is why he wants the nomination. “I backed (John) McCain, and that I understand, he had a hard time with that one because lots of bad things were happening,” Trump said. “And I backed Romney — and that’s one that should have been won and he failed — he failed us, very simply, and I’m not happy about it. “This time I said, ‘I’m not going to let it happen again, I’m going to do it myself,’” Trump continued. “A country isn’t a country unless we have a border,” Trump said. “We’re going to have a border, and people are going to come into the country but they’re coming in legally. They’re not coming in illegally. Trump plans on the funding for this wall coming from Mexico. Trump expressed that the idea for a wall was specifically to combat drug trafficking and illegal immigration and not from a place of political incorrectness. Trump criticized current President Barack Obama. Trump went on to discuss the issues that the country currently faces. Trump also said that he has a plan that can lower taxes. “We’re the highest-taxed nation in the world,” Trump said. “We’re bringing corporate taxes and small business taxes down to 15 percent. We’re simplifying the tax code. We’re going to have four tranches, it’s going to be so beautiful; it’s gong to be so dynamic; it’s gotten some great reviews. Trump went on to explain that nobody actually knows the amount of money that is in the offshore accounts, but the reason that the country has been having difficulty bringing it back to the United States is because it would be too expensive because of the taxes. “A lot of companies are going to be leaving the United States to go get that money,” Trump said. “They are going to now move out of the United States, and these are big, strong, powerful companies with thousands and thousands of jobs, and they’re also going to get a better tax deal. As Trump exited the stage and began greeting the potential voters, Twisted Sister’s “We’re Not Gonna Take It” began playing. The crowd erupted in applause as Trump turned for one final wave before disappearing behind a curtain. After the rally was finished, a small plane with the words “Make America Great, Vote Trump” displayed on the underbelly flew over Burlington.